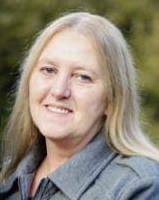 Cindy Gay, age 57, of Old Fort, passed away Tuesday, April 9, 2019 at St. Joseph’s Hospital in Asheville. Cindy was born in Greensboro, NC on June 26, 1961 to the late James L. and Jean McKenzie. As a young child, her adoptive parents, W. R. and Edna Graves accepted her into their lives and raised her. A loving, caring mother and grandmother, she was also a “Mom” to many of her children’s friends and was a wonderful, positive influence in their lives. The deep and abiding love she showed to those she knew lives on in those she leaves behind. Cindy enjoyed the simple things in life, whether it be beautiful flowers or enduring friendships, those whose lives were touched by her will never forget her. Surviving are her life partner of close to 30 years, Dannie Hogan; two sons, Robert Gay and wife Sonni and Travis Gay and wife Debra, all of Glenwood; a daughter, Beverly Middleton and husband Daniel of Marshall; three brothers, Rick and Jerry McKenzie, both of Baxley, GA and James Smith of Nebo; two sisters, Carol Williams of Baxley, GA and Lee Ann McKenzie of Rincon, GA; six grandchildren, Aspen, Garrett, Harley, Raelyn, Savannah and Ty; one great-granddaughter, Maxine; and her beloved canine companion, Roxy. A service of remembrance and celebration of her life will take place on Saturday, April 13, 2019 at 11:00 a.m. in the chapel of Westmoreland Funeral Service in Old Fort with Rev. Dennis Love officiating. The family will receive friends from 10:00 – 11:00 a.m. prior to the service at the funeral home. Following the service, Cindy will be laid to rest in the Davistown Cemetery.